If a child is to develop normally , certain conditions must apply and his/her essential needs must be met. Growth and development are , therefore excellent criteria for evaluating the child’s state of health and well-being. 1. Close to the mean value , between limits (for age) within which 95% of healthy reference children are found. When one says a measurement is on the 50th percentile (50 pc), this means that 50% of children of the same age in the reference population measure more than that amount (e.g. taller or heavier) and 50% are below (e.g. shorter or lighter). 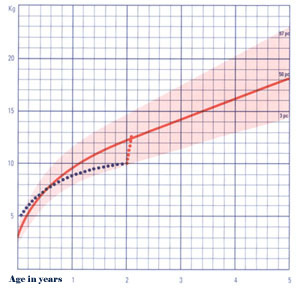 If a measurement is on the 97 th percentile , this means that 97% of children in the reference population fall below this level, and 3% are above. Conversely , a measure on the 3 rd percentile will be below the values for 97% of normal children of the same age and above those for only 3% of normal children. 2. Progressing at a normal rate: a curve is normal only if it is similar (parallel) to the normal percentile curve. If , for example , the weight curve crosses the percentile curve downwards (see figure 1,.) , a cause must be sought (e.g. malnutrition ,chronic disease); if , no the other hand , it rises more rapidly than the percentile curve (see figure 1. ), this may indicate , for example , a “catch-up” growth after a period of illness or malnutrition , or oedema from any cause , or developing obesity. 3. Without any substantial discordance between the various aspects of development (e.g. weight, height and sexual maturation ).The child’s psychomotor and intellectual development can be evaluated by many tests of which we will give only a few examples. As for physical growth, these parameters can be compared with those from a healthy reference population of the same age. Fig.1-Growth curve (weight-for-age); example of abnormal growth. · The standards most commonly used for evaluating physical growth are those of the National Center for Health Statistics (NCHS) , derived from studies of a large number of children of different races in the United States. They are recommended by WHD. · Weight (Fig.2): an easy measurement to make with a few elementary precautions (child naked, balance tared). The significance of weight-for-age is , itself , of limited value , but the rate of weight gain (the growth rate) is a very sensitive index of good health. N.B. : when a child is weighed , check that there is no oedema (see also malnutrition and glomerulo-nephritis) , which affects the measurement. · Height (Fig. 3) : This measurement demands more care and precision than weight , but still represents “good health” when it is adequate. Height develops too slowly for it to be an efficient indicator of acute malnutrition. However , it is a good index of chronic conditions (manutrition or disease); it is also a good index of the general state of health of populations. 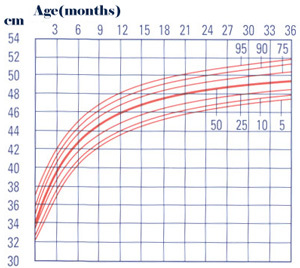 Growth rate varies according to the different periods of a child’s life. It is maximal in the first five months, then declines and later goes through a “ spurt” at adolescence. The growth rate slows during acute or chronic episodes of malnutrition or disease; precise and closely spaced measurements of height allow the demonstration of periods of slowing and acceleration. The measurement of supine height (length) requires an accurate measuring board and two helpers; standing height can be measured after 24 months of age, needs only one helper and is about 10-30 mm less than supine height. · Weight/height ratio: the ratio of these two measurements can help assess “wasting” and give reasonable indication of growth independent of age, for example when age is difficult or impossible to determine precisely. · The wasting diagram (Fig.4) is a way of expressing the weight/height ratio which allows one to detect wasted children quickly. Each column is marked with a weight , with three colored areas in the upper part. 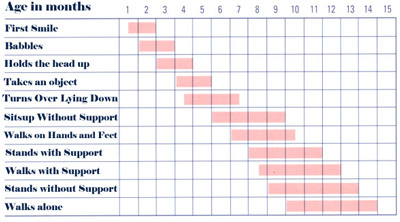 These show the relation between the child’s weight-for-height and the standard weight-for-height (NCHS standards). The child stands against the chart in front of the column representing his weight. The color shows the degree of wasting. 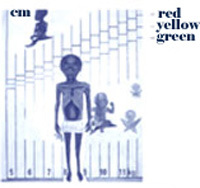 “Very wasted” children are detected by red; yellow indicates “wasted” , and green shows normal weight-for-height(90-110% of the NCHS standard). · Head circumference (Fig.5) is an easy measurement to take (maximum circumference), may reflect the development of the brain and can help with the diagnosis or monitoring of neurological conditions. · Arm circumference: to be measured on the left arm. It can be used to help assess nutritional state and muscle mass. It is quite stable (14-16 cm) between 1 and 5 years of age (Table 1). · growth retardation in the absence of severe malnutrition or chronic disease requires detailed investigation in depth, for which the child should be REFERRED. This includes motor development, i.e. development of tone and prehension movement and stages in the development of affect and social relationship, i.e. all that which concerns relations with others (adults and children), and the acquisition of language. The same stages are always followed, usually in the same order. It is helped by close contact between mother and child and by the family environment. The process of weaning , the birth of another child and separation from the mother may retard this aspect of development. · walk at about 1-2 years of age. These different milestones are passed progressively (Fig. 6). Fig. 6- Important stages in psychomotor development. Between 9 and 12 months, the child also begins to hold objects between thumb and forefinger, and speaks its first words. Sphincter control begins between 15 and 18 months; at this time , the child can say several words and combines two words to from short phrases. After 2 years of age, he becomes clean day and night; language becomes more elaborate with complete phrases. · a child who makes no or only slow progress. When this occurs , one should take a history and make a complete examination; if it is confirmed that there is psychomotor retardation, REFER for diagnosis and management.